21 Aug, 2013 First Google, and now Facebook, want to connect the world to the Internet. Surely, this can only be a good thing, right? 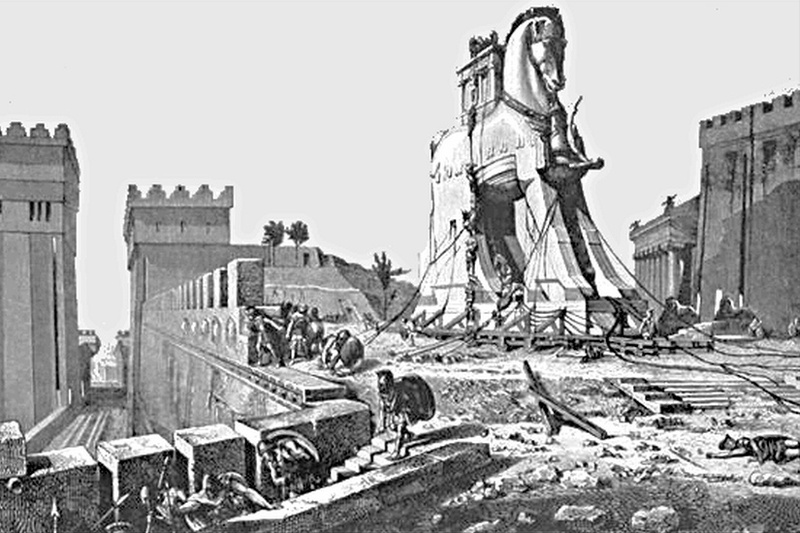 The Trojan Horse also looked like a good deal at the time. First there was Project Loon from Google, and now there is internet.org from Facebook and friends. Both projects share a similar, outwardly noble goal: to provide Internet access to people who don’t currently have it. There is nothing wrong with the goal itself. However, I have strong reservations about why Google and Facebook want to be the ones providing this service. Why do Google and Facebook want to give you Internet access? When you don’t own your Digital Self, you become, in essence, a Digital Serf. There is no big conspiracy here. Remember that both Google and Facebook are publicly‐traded transnational corporations that are legally mandated to act in the best interests of their shareholders. They do this by trying to maximize their profits within the frameworks of their respective business models. To understand their motivations, we need look no further than those business models. So, the question becomes: how do Google and Facebook make money? Both Google and Facebook make their money by monetising your data. Your data is their raw materials. By analysing your data, they build intelligence about you — a profile of you; a virtual you; a Digital Self, if you will. This is their value add. And they own not just your data but, perhaps even more importantly, your Digital Self also. And it is this Digital Self that they sell to others. It is, in a sense, virtual slavery. When you don’t own your Digital Self, you become, in essence, a Digital Serf. Instead of your corporeal self being sold to the highest bidder, it is your Digital Self that is kept shackled in Google’s and Facebook’s data banks, to be sold over and over again to the highest bidder. So, the answer to our previous question is simple: Google and Facebook want to give everyone access to the Internet because they need more raw materials. More data. Your data. So they can cultivate more Digital Serfs to sell to their customers. And where better to mine that data, where better to find new Digital Serfs, than in disenfranchised areas of the world with weaker governments and privacy laws? Just as missionaries provided education and health care with a caveat (believe as we do), so too are the leading beacons of the Church of Technology of Latter‐Day Closed Silos on a mission to bring the Internet—their Internet—to the digitally‐illiterate natives of our day. The caveat being, sign in as we do. Can you imagine if your only perception of the Internet was one where you had to sign in with your Google or Facebook account? Where your only choices were to experience the Google Internet or the Facebook Internet or to remain disconnected? This is exactly the choice that these people will be faced with. They will know an Internet where the norm is that their raw materials are the property of a faceless foreign corporate entity. An Internet where the norm is that they are Digital Serfs. What Facebook and Google have done is discovered a village with no water and they plan to bring them cheap Coke to buy. If their motives are truly honourable, then there is another glaringly obvious option: they could teach them to build a well. Yes, of course everyone deserves access to the Internet. But they deserve access to an open Internet where they can own their Digital Selves. No one deserves to be a Digital Serf, especially those who do not have the luxury of having other options. And this is exactly what will happen if Google and Facebook are allowed to provide Internet access.